Club Eirne sponsored Blitz in conjunction with Fermanagh Senior Footballers and Coaching & Games are hosting a U10½ & U8½ Go Games Blitz. 8. All scores equal 1 point. To provide all clubs with an opportunity of participating in the blitz, clubs are invited to confirm their attendance and correct numbers of teams ASAP. As part of planning, we will endeavour to allocate specific pitches and fixtures (if needed due to numbers) for U10½ and U8½ teams. All Clubs participating in Go Games Blitz must provide 1 Go Games Referee and ensure they have a first aid person with them. Due to the Holy Week ceremonies, there will be no Tempo Óg on Good Friday, 14th April. Tempo Óg will resume on Friday 21st April at 6.30pm in the field. All primary and playschool children are invited to come along to meet up with their friends, or to make new friends, but most of all to have some fun! 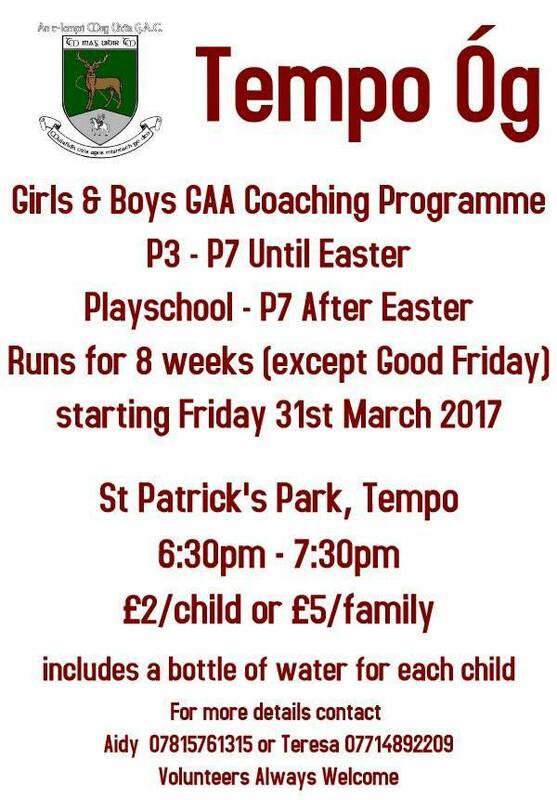 The Tempo Óg coaching program for primary school children resumes this weekend. Please note that it will be at a new day and time, Fridays from 6.30pm to 7.30pm. For the first two weeks, leading up to Easter, the program will be aimed at primary school children in P3 to P7. After Easter it will be extended to the younger children. There will be no Tempo Óg on Good Friday, 14th April. Games for P6/P7 will go ahead this Sunday, 5th Feb as originally scheduled. Please note that P4/P5 will now be on 5th and 12th March. Fermanagh Coaching & Games have set aside a number of dates in the Lakeland forum to pilot indoor Gaelic. It is proposed to have 5/7 aside games (Teams of 10 max). Games will be 13 minutes straight through, and there will be a one touch rule. P6 & 7 will be Sunday 29th Jan and Sunday 5th February. Games will run from 4pm to 5.30pm. Children should arrive togged out at 3.50 to give a few minutes to get organised. 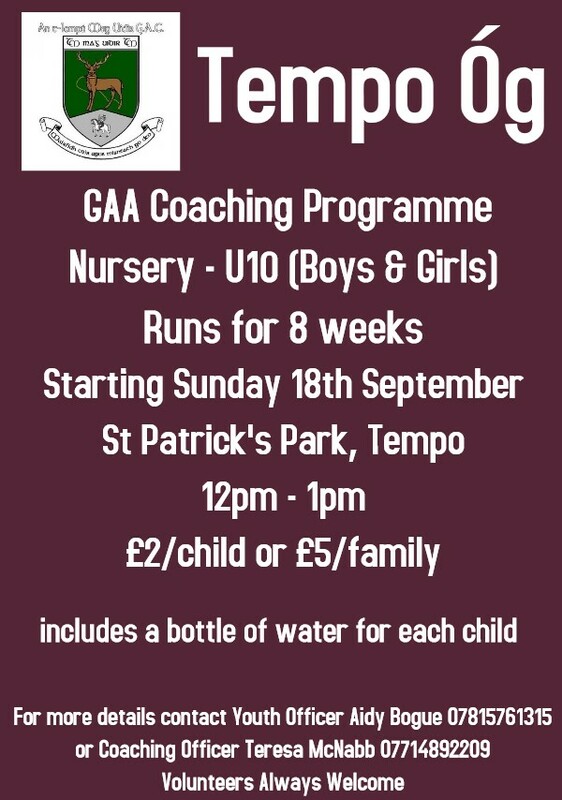 The hugely popular Tempo Óg coaching programme for young boys and girls resumes this Sunday at 12pm at St Patrick’s Park, Edenmore, Tempo and runs for 8 weeks. All children from nursery school and primary school are welcome to attend. The cost is £2/child of £5/family and all children will receive a bottle of water after each session. We need not only children but volunteers to make this a success. We hope to see you there. Please note that Tempo Og is for all children in Primary school, and not just for those U10! 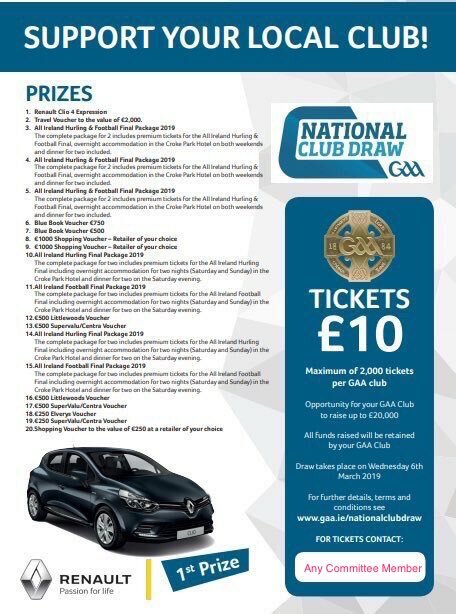 Tickets for this year’s National Club Draw are now on sale priced at £10 each. There are a large number of excellent prizes on offer including a Renault Clio, a €2,000 travel voucher and many more. See attached photo for full prizes. All proceeds from ticket sales are retained by the club. We would ask for your support with this fundraising initiative. 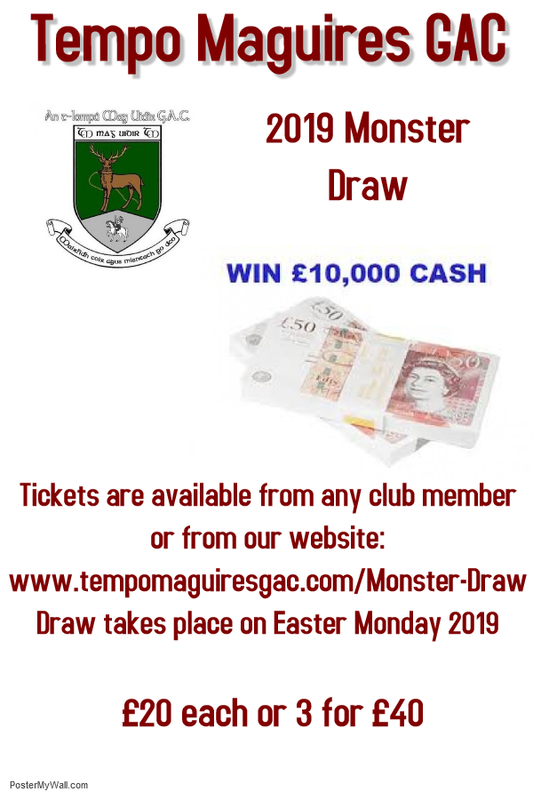 You can buy your tickets online at https://www.klubfunder.com/Clubs/Tempo_Maguires_GFC/Events//National_Club_Draw or from any member of the Executive Committee.